All Nuthatches belong to the Family:Sittidae and are of the Genus:Sitta. Nuthatches are a ubiquitous genus of birds, represented in both Old and New Worlds and found on every continent except for South America. Africa is marginally inhabited by minor populations of Nuthatches; only Algeria and Morocco claim a Nuthatch species—the Eurasian Nuthatch subspecies, S. e. hispaniensis. The 25 species are famous for their ability to climb down trees face-first and cling to the undersides of branches. Nuthatches have earned their name from their fondness for their method of breaking and eating nuts and other tree seeds, especially in autumn. Their habit of wedging a large food item in a crevice and then hacking at it with their strong bills gives this group its English name. Most of these sprightly birds lead a solitary life, only occasionally associating with foraging flocks of other small birds. Once autumn arrives and breeding season is over, family units break up, and it is unusual to spot more than two Nuthatches together. The Nuthatches of North America are slightly more gregarious than those of Europe; European Nuthatches tend to defend their territories year-round. Most species of this tiny bird are non-migratory. The list below is of the Nuthatch species which are at this time accepted as belonging to the Genus: Sitta. Their ranges and population estimates are also given (around 2012). Nuthatches are diminutive, mainly arboreal birds, most of which dwell in the Northern Hemisphere. The species is thought to have originated in southern Asia, and 15 species are known to exist in the mountainous regions of central and southern Asia. 12 of these species are ecologically isolated from one another. Most Nuthatches can be found in evergreen and coniferous forests, and each species has a preference for a specific type of tree. Even so, most species inhabit mixed woodlands. Species which share the same territories will abide and breed at different altitudes to maintain their privacy. Some live in tropical and subtropical lowland forests, choosing between dry or moist, deciduous or evergreen trees. Others live in temperate forests, divided between coniferous, broad-leaved or mixed woodlands; some share the same habitats, but are separated by altitudinal differences, particularly in alpine-zone forests or rocky hill slopes. 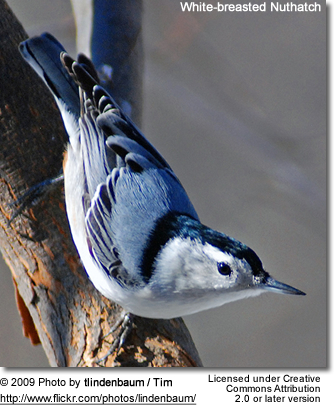 Nuthatches seek out warmer climates, with the northern species living at moist lowland levels; however, the species which live in southern regions dwell in higher, cooler elevations. 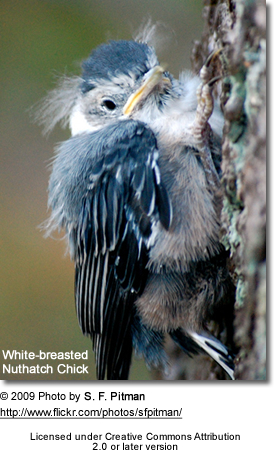 For those non-migratory Nuthatches living in colder climates, the wintry weather can be devastating. They will cluster close together in communal roosting sites to conserve body heat. As many as 170 Pygmy Nuthatches have been observed in a single roost! Nuthatches are plump, short-tailed birds with robust bills. These are generally elongated, but can be curved as well. They are known for their short legs, long toes and strong claws which are adapted for climbing. Most species possess great agility in climbing on tree trunks, moving upwards, sideways, or downwards, head-first, hoping to find stored seeds missed by other birds but easily see from a face-down perspective. Adaptations to the feet allow for this incredible dexterity; Nuthatches are even able to walk upside-down under overhanging branches! Unlike the creepers and woodpeckers that must use their stiffened tails to support them, Nuthatches do not use their softer tails for climbing. The Rock Nuthatches exhibit the same nimbleness as their forested cousins when scaling rock faces in the cliffs and gorges they inhabit. Nuthatches possess easily recognizable physical features. They are solidly build; their heads are large, their legs short, their wings tight and their beaks and feet strong. Twelve square, short tail feathers fan out from their bodies. In plumage, the Nuthatches display variations on the normal blue-gray upperparts and black eye stripes. Their head patterns are also variations on the black, white and blue-grey. Their underparts vary from white or buff to rufous. Some species have rufous on their whole underside surface; others have rufous markings only in small areas, such as on the breast band. Some of the Asian species’ upperparts are violet-blue instead, and some have red or yellow bills. Often their white underparts are brushed with various shades of buff, orange, rufous or lilac. Head markings are similar between the species: All have some form of black eye stripe, white supercilium, and black crown. Males and females appear similar, although there may be some differences in the colors of their rear underparts. Immature birds show nearly identical markings to the adults. Nuthatches vary in size. 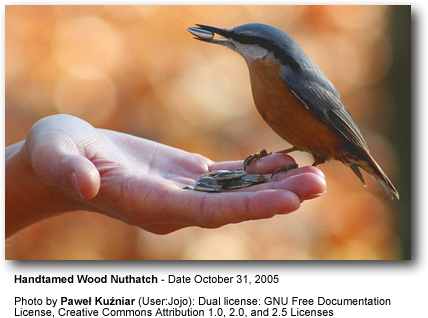 The Giant Nuthatch can grow to 195 mm (7.75 in.) in length and 36-47 g (1.3-1.6 oz) in weight. Alternately, the tiny Pygmy Nuthatch may only reach 100 mm (4 in) in length and 10 g (0.36 oz) in weight. North American Nuthatches will grow to be 3 ¾-6 inches long. Very little is known of their lifespans; in the wild, they may only live 2-4 years, but longer lifetimes (12 plus years) have been recorded. Most species of Nuthatches choose temperate northern, forested areas in which to breed and build their nests. However, the two Rock species of Eurasia have chosen warmer, drier regions, preferring rocky terrains to woodlands. All members of the Sittidae family are solitary breeders, each pair having its own defended territory. They are monogamous, pairing for life. Although courtship displays vary between the species, they always involve the male drawing attention to the brightly colored markings in his plumage. He will ruffle his flank feathers to exhibit the chestnut coloration and spread his tail feathers to show off its white spots. Some American Nuthatch species will excavate holes in trees in which to place their nests, but most use existing openings. 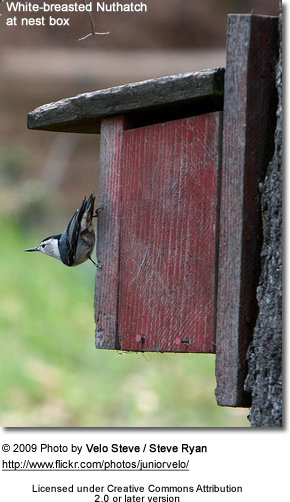 Occasionally, Nuthatches will nest in man-made nest boxes. Once they have found suitable cavities in tree branches, they will begin to construct their nests. Rock Nuthatches build their nests out of mud and attach them to fissures in the rock face. Together, the pair builds a cup-shaped nest of plant fibers and cobwebs. They will line it with soft materials such as bark flakes, seed husks, moss, grass, with fur and feathers on top to cushion the eggs. It will sit in a forked branch up to 60 feet (around 18 m) above ground. Some species will camouflage the nest on the outside with flakes of bark; Old World species plaster mud around the entrance hole to make it smaller and to discourage predators. American species do not use this technique, although the Red-breasted Nuthatch will smear pitch around the entrance opening. Although the male participates, nest building is primarily the female’s chore. The eggs are white with tiny reddish-brown speckling. Clutch size varies; birds in the northern areas will produce larger clutches. The female will incubate them for 12-14 days; later, the male helps with the feeding of the young during their 23-25 days in the nest. In two of the American species, the Brown-headed and Pygmy, previous offspring remain nearby to assist in caring for the young. West European Nuthatches favor Hazel nuts, acorns, beechnuts, conifer seeds, insects and other invertebrates which they wedge in crevices and tree bark for winter retrieval. Hiding these seeds is time-consuming, but the stored seeds tide them over through winter, when days are short and searching time is reduced. They will push as many seeds or insects into a cavity as they are able, making searching easier and providing them with more food. When it comes time to retrieve their seeds, they probe deep into the bark in search of them, often upside down, from a better vantage point. Other places are used as well—openings in the ground, under stones, behind bark flakes—remaining there for as long as a month before being sought again by the birds. A bright species, the Nuthatch will refrain from using up its supplies of food as long as there are other foods available, thus saving them for austere times. The number and movements of many birds of northern, temperate forests, Nuthatches included, are strongly affected by the seed supplies in their habitats. They will migrate south when the seed supplies dwindle. During breeding season, Nuthatches forage within their territories; at other times, they may join mixed feeding flocks outside their areas. Nuthatches vocalize to announce their territory, and they possess a wide variety of whistles, trills and calls. Their uncomplicated breeding songs sound like their contact calls but are longer in duration. Their songs are mainly repetitions of a single note, similar to a trill in some species. The European birds can also be heard expressing a loud, piping twee-twee-twee and a metallic chwit as a contact call.